Do You Need a Spiralizer? Want to know something I hate about cooking? Apart from washing up, my biggest ‘pet peeve’ is single-use kitchen gadgets. You know, the tools that only have one purpose. As a lover of simplicity I can’t stand a cluttered kitchen with cupboards and drawers crammed full of stuff that hardly ever gets used. Which is one of the reasons I put off buying a spiralizer for so long. I already had the technology to make ‘pasta’ and ‘noodles’ from my veggies using either my mandoline or vegetable peeler. But a few months ago I saw a photo on Instagram of someone’s spiralized zucchini noodles and I had to do a double take. Really. It looked like proper pasta. After much deliberation, I decided to get myself a spiralizer to try it out. With the proviso that if it didn’t earn its keep, I’d donate it to charity. No. It’s not something you need in the kitchen like a good sharp knife and chopping board. But! I must admit I do love mine. It’s not going to charity any time soon. The first time Fergal and I made our zucchini ‘noodles’ to serve with a ragu, my kitchen helper actually ate all of his zucchini (even with his toddler’s distrust of green vegetables). I can’t tell you how happy I was. Which Veg Can You Spiralize? My go-to noodles so far because of their mild flavour and pasta-like quality. Plus it’s zucchini season around here right now! To prep: Make noodles then noodles then sprinkle with salt. Stand at room temp to soften and warm slightly for up to 3 hours. Use raw. To prep: Make noodles then cover with boiling water. Stand for 60 seconds then drain well. Stronger flavour and higher carb content than zucchini but super pretty! And a firmer bite. To prep: Make noodles then cover with boiling water. Stand for 2 minutes (or longer for softer noodles) then drain well. To prep: Make noodles then then pan fry in a little oil or butter. I haven’t tried beet noodles yet but imagine they’d be best raw in salads or prepped the same way as carrot noodles. Something I haven’t tried yet but imagine they’d be best pan fried in a little oil or butter. Also called celery root these noodles have a lovely sweetish flavour. And the colour is nice and pasta-like. A good Winter time noodle. To prep: Make noodles then cover with boiling water. Stand for a few minutes then drain well. Another spiralizer use I have yet to try. Have book marked this idea for post-pregnancy (and gestational diabetes). We had fried potato ‘squiggles’ at a restaurant in Sydney and they were off-the-scale good from a crunch perspective! OMG. I hadn’t even thought about using sweet potato until I sat down to write this post. I’m thinking these might need to be gently simmered until no longer crunchy and then well drained. OR pan frying in butter or oil. If you try it – do report back! The obvious choice! But don’t be limited by just replacing your spaghetti in your spag bol. You can use your spiralized noodles with any of your favourite pasta sauces. Really there are no limits. Zucchini Noodles with Broccoli & Pine Nuts. It took me a little longer to think of this but your spiralized noodles work equally well with Asian noodle dishes. Sometime even more so than with Italian style dishes because there’s usually so much flavour going on the noodles only provide bulk and texture. Don’t believe me? 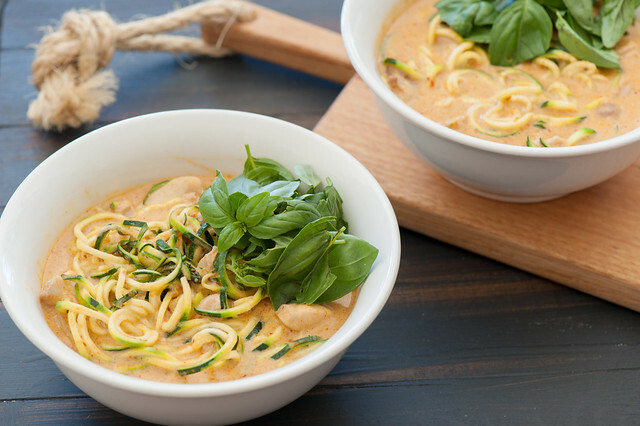 Then check out my Zucchini Laska recipe below. Parsnip or celeriac or carrot noodles in this Simple Soba Noodle Soup. Serve this stir fry with Zucchini noodles. This Asian Beef with Zucchini Noodles. Think about your favourite shaved vegetable salads and your spiralized noodles can add a new textural element. Spiralized Carrot instead of grated in this Carrot Tabbouleh. Spiralized Beets instead of grated in this Raw Beet Salad. Are you a spiralizer fan? Got any other tips for getting the most out of it? I’d love to hear in the comments below. Laksa is the most delicious noodle soup that hails from Malaysia. It’s fragrant, it’s rich, it’s spicy. Plus there are noodles to slurp! Since focusing on eating grain-free and low carb, however, laksa has been off the menu at our place. But not any longer! I was so excited when I had the idea to use some zucchini ‘noodles’ instead of the usual wheat or rice based laska noodles. It’s really that good! 1. Using a spiralizer, turn your zucchini into medium thick noodles. Sprinkle noodles with a little sea salt and stand while you make the soup. 2. Bring laksa paste and coconut milk to a simmer in a medium saucepan. Add chicken and continue to simmer until chicken is just cooked through (no longer pink.) About 5 minutes. 3. Add zucchini noodles and bring back to a simmer. 4. Taste and season with salt or fish sauce (if you have it). Some people might like a pinch of sugar. 5. To serve divide soup between two deep bowls and top with basil leaves. no spiralizer – use a mandoline or vegetable peeler to slice zucchini into long ribbons then hand cut into medium ‘noodles’. vegetarian / vegan – make sure your laksa paste is vegetarian and replace chicken with firm tofu chunks. Or use chunks of roast sweet potato instead. Cauliflower is also lovely – just simmer until florettes are tender. carb lovers – add cooked hokkien, singapore or rice noodles with the zucchini noodles (or instead of the zucchini). Non purists could also use cooked spaghetti. no laksa paste – use another thai curry paste like red or green curry or even an Indian curry paste. Just be careful to adjust the quantity to your liking (you probably won’t need a whole jar). The other option is to go for a coconut milk based soup so just skip the laksa paste and use a good squeeze of lime juice for some zing. hot! – add finely sliced fresh red chilli. no basil – you could skip it or replace with mint or coriander (cilantro) leaves. more veg – add in chopped veg such as carrot, red capsicum (bell pepper), cauliflower and simmer until tender before adding the chicken. OR serve with a handful of rinsed bean sprouts. Also see: 16 Tasty Ideas for Zucchini. I LOVE my Spiraliser so look look forward to more recipes from StoneSoup, Jules. I also note that one of our famous chefs has a book of recipes coming out this month. I have yet to try the spiralise then chop the spirals method advocated on some websites. You put the spirals in a food processor to do this. Love your work. It’s a shame the Simple Year cost is US$. Yes I know with the current exchange rate A Simple Year is a bit expensive now. But since it’s a global audience we needed to keep it simple with just one currency. A spiralizer? I never paid much attention to the name on the box, but I think I have had one of these critters for over 25 years. It was standard equipment at the restaurant supply store back then, but sort of disappeared over the years. The concept was to jab a potato on the tool, spin the handle to make a pile of nest-like potato shreds. Then drop the nest into the deep fat fryer to keep one’s carbohydrate and grease levels up to par. Almost impossible to resist. Sprinkle on some cheese curd and a splash of brown gravy … call me a cab or a wheel barrow as the case may be. You’re obviously ahead of our time! I don’t have one, but I want one!! What version do you have? I’ve had a spiralizer for about 3 years now and love it. We call it a Spiral Vegetable slicer in the US. I mostly use it on Zucchini to make Paleo spaghetti or on Sweet Potatoes after a workout but thank you for the other veggies ideas you’ve given here. Great post. I’m from the US and I’ve only heard it called a Spiralizer! Funny that one post says “Spiral Vegetable slicer in the US.” I’ve never heard that! Thus my struggle right now to order an Insta Pot…..ALL THOSE USES!!! :) A minimalist heaven! You’ve got me intrigued Chelsa… I’ve never heard of an insta Pot? I’m pretty intrigued…crock pot that you can sear your meat in??? using the pressure cooker option on dry beans so they are done in 35 min from dry???? Yogurt maker, ricer cooker??? I’m thinking Im going to bite the bullet and toss out my reg crock pot! I am contemplating buying a spiralizer. However I do have an instant pot. And it is my favourite thing. Pressure cooker, slow cooker, rice cooker and so much more all rolled into one. I would recommend it to anyone. Invaluable when you are grain free! (I don’t have one, but I want one!! What version do you have?) Ditto. I have a small handheld cheap one that works well on zucchini but not much else. Hi Jules, I’d love to know what one you use? I’ve recently bought a cheap ($30), handheld version but the centre of the zucchini is “wasted” (I chop up and use anyway), and often I find the blades get blocked and it stops working halfway through on zucchini, so this piece of equipment is no longer getting used in my household! Are the spiralizers closer to the $100 mark really worth the money and space they take up?? I had a handheld one first and it went straight to charity…. I think it’s worth getting one that has some soert of handle to turn the vegetable Kirby but you shouldn’t have to spend $100 on one. I have one and I love it. Beets and carrots are amazing raw in a salad with bit of arugula and goat cheese and nice vinaigrette. Cooking I’ve had bad luck as always seem to over cook them. Apple… interesting Sam… thanks for sharing! OMG…just bought a spiraling and I am having so much fun with it! I can create 3 types of spirals, but thus far my favorites are the sweet potatoes either in ribbons or spiral. I then bake them in the oven after shaking them up in a bag with olive oil, cinnamon, pumpkin pie spice, sugar and salt. Yuuuuuummmmmy!!! I probably use my Paderno Spiralizer about 2 to 3 times a week. Being low carb and gluten free had made my love for pasta a thing of the past. Now I can indulge. 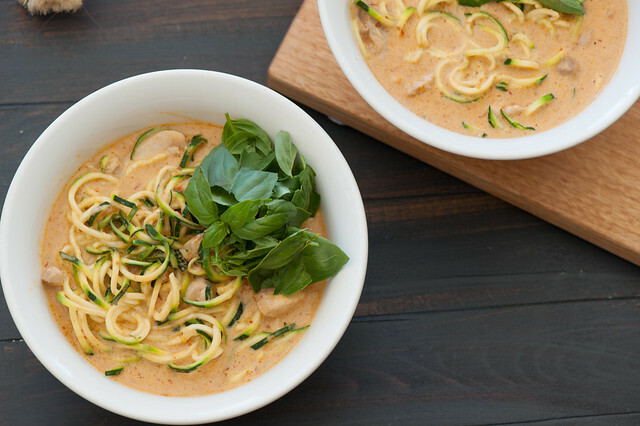 I’m out of the country right now but will be making the Laksa with zucchini noodlles when I get home. Thanks Jules. I’d be interested to know the brand names of the ones people have because my only complaints about the paderno is that it is sometimes hard to get the blade out for washing and the suction doesn’t always stay on the counter when I am working with it.. I’ve seen one advertised called the Insprializer that has 4 blades that are built in and selected with a knob – does anyone have that kind and would share its pros and cons? As I menitioned Janet I don’t like to talk about brands because Stonesoup readers are a global lot! I smiled as I read this as I resisted getting a spiraliser for the same reason (not into gadgets and gimmicks) but eventually gave into temptation and am glad I did. I use it several times a week and love it. One veggie which I found works really well (albeit with a different texture than the others) is continental cucumber. It gives a slightly juicy noodle but works great with a nice punchy Asian dressing. Yes, I’d love to know your preferred brand of spiralizer, I need to get one!! And I like that it packs away compactly. I love this.Thanks for sharing ! Spiraliser? That is something new to me, but I think that I would look at it at the department store when I go there. I love mine! Does anyone have any tips on how to cook zucchini noodles in the microwave? Thank you! Love, love, love mine! Best gadget if you follow a low carb diet! if you dont own one, get it! Great post! Have been making flat zucchini noodles for a while now but you’ve convinced me to get a spiralizer. Also found that spaghetti squash is a great substitute for rice ( or any thin) noodles in Asian- style stir fry. Has a similar texture to rice noodles and takes flavours well. Thanks for mentioning spaghetti squash Marita! Loved this recipe Jules! So much flavour. My husband liked it too! I saw spiralizers for sale at KMART in Australia the other day. Only $15. Not sure they would be as good as the more expensive ones but worth a shot I suppose! Glad you enjoyed it Sam! You can get ‘spiralizers’ which are more like a 3D microplane grater where you have to twist the vegegetables with your hand – I tried one of them and it was a complete waste of time… So I’d make sure this spiralizer has some sort of mechanism which turns the veg for you before investing my $15! Hi Jules, i love my spiralizer, and i have to admit that your article brought me to search for it. I have one question – how to spiralize harder vegies (like sweet potatoes) – do you also spiralize cooked vegies? Thanks a lot and i really enjoy your blogg and your meal plans. Hi Jules, thanks for the tip on keeping your spiralizer sharp to deal with harder vegies, and on the advice given to Sam about making sure it has an effective mechanism; this will be of great help to me when I look for one!